All “Purple Pipe” tubing products are marked with CB Supplies as the manufacturer, Reclaimed Water name, nominal size, design pressure rating and temperature ratings, relevant ASTM standards number, manufacturing date and production code, with incremental footage markings and white indent markings for permanent identification. This pipe is available from 3/4″ – 2″ CTS diameter with a 200 psi rating in a variety of coil lengths. 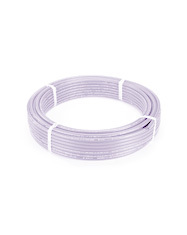 The tubing is produced with a purple (Pantone® 522 C), UV stabilized outer layer that is incrementally marked and indent printed for easy identification. The inner layer of tubing is black to provide long-term UV protection.